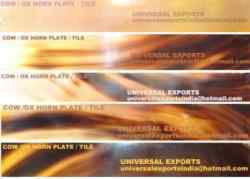 Universal Exports is a reputed manufacturer and exporter of Ox Horn Plates in India. Our high quality ox horn and bone plates are made from best quality raw material to provide best usage in horn & bone handicrafts, horn belt buckles, horn costume jewelry, horn crafts, horn tiles, horn cutlery such as forks & knives, salad sets etc. Ox horn plates manufacturered by us are available in various colors and sizes. However, we are also capable to make cow / ox horn plate blanks as per requirement of clients. We offer wide range of buffalo horn hollow plates, buffalo horn natural plates buffalo horn scales, horn knife plate,real horn scales. We assure our clients to fulfill their requirement by giving them sizes and colors of their choice. This specialization of ours helps us to establish ourselves as the best ox horn plate manufacturer & exporters in India. We offer buffalo, cow and ox horn rolls of very fine quality. The real buffalo horn rolls manufacturered by us are perfect example of our craftsmanship in these products. We supply buffalo horn rolls in various color and style.This is available in very competitive price in the market.Unique handicrafts are made from these high quality buffalo horn roll, cow horn roll and other animal horn roll made by us. We make animal horn roll , cow horn roll as per clients requirement.